Sophie is a diligent teenage girl working in her family's hat shop, but her life is thrown into turmoil when she is literally swept off her feet by the handsome-but-mysterious wizard named Howl. This innocent encounter enrages the vain and conniving Witch of the Waste, who transforms Sophie into a 90-year-old woman. Sophie's efforts to break the curse bring her to Howl's magical moving castle where she befriends Michael (known as Markl in the Disney translation), Howl's apprentice, and the hot-headed fire demon Calcifer. Her love and support for this strange new family have a major impact on Howl, who can be maddeningly self-indulgent and singularly noble. He defies royal orders to participate in a meaningless war and risks his life to bring peace to the kingdom, but the more he uses his power the more he transforms into a monster. With Howl and Sophie each looking for their own true identity and a secret contract between the wizard and his fire demon, they're drawn together despite the raging war around them. The movie is put together really well. The scenes flow nicely from one another, backed by beautiful scenery and fitting music. Although the genre is Fantasy and Romance, there are plenty of other emotions for you to enjoy, especially in the interaction between Sophie and Calcifer, and Sophie and Howl. The characters Calcifer and Howl are what makes this movie stand out from the other Miyazaki movies, and it contributes to the reason that Howl's Moving Castle is one of my favourites so far. Miyazaki's works are always beautiful but I loved this one particularly because of the magic, the story, the breathtaking settings and the meanings. The strange thing about this animated film is that it's very difficult to sum up the plot because a thousand things happen that seemingly have nothing to do with each other, but that all together make up the story. And… in the simplicity of the whole there is something extremely pleasant. HOWL: "I give up, I see no point in living if I can't be beautiful." One of Miyazaki's best works with a heart warming story and animation. A pretty nice adaptation of the book (with some minor edits here and there) with beautiful scenes, characters and moral. And a ditzy, self-absorbed magician guy who goes around traveling in a moving, creaky castle, powered by a fire demon. Calcifer is awesomesauce. The dog is the king. 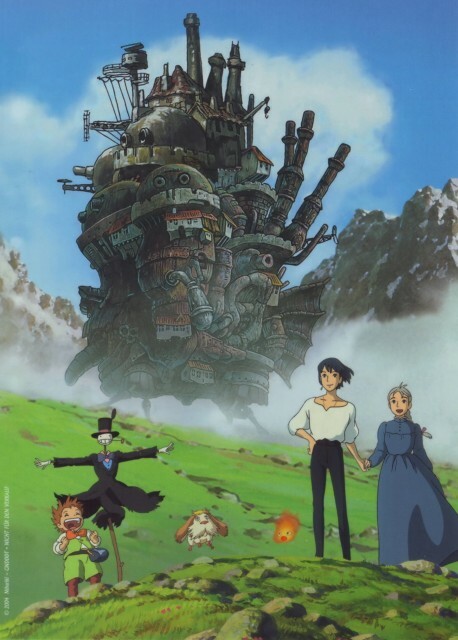 Howl's Moving Castle is one of those anime movies that I really love. The plot itself is unique and the characters are really likeable. Though there are some confusing elements, the movie itself is nice to watch. I personally like Howl's "moving castle", the changing stations and other magical stuff. But I feel that there's a need to explain Howl's past more. I would really be glad if this were made into a series so that pasts and the plot can be made clear. This anime is so different with other anime I ever seen. It took a Grandma as the main character. It's true Sophie isnt actually a Granny. she becomes like that bcoz a curse. But, 80% of this story told us about her adventure in Granny form. N it's funny n great. Howl, the main male character is also an interesting wizard. He is cool but sometimes so childish. I also like the fire spirit n the kid (Howl's assistant I guess) character. But I forgot their names. The last time I wrote my comment, it was pretty short, so I decided to edit the whole thing. I never read the novel, but I am planning on reading it, when I get my hands on it thou. It's pretty hard to find such books at the place I live in. But for the movie, I'd say I'm in love. It was beautiful and magical (xD of course it is), it always brings a smile on my face when I watch it again and again. But I also cried a bit. The English dub was surprisingly good too! I really love this movie. It is one of Ghibli's Best work ever for me. No matter how many times i watch it i never get bored and with every time i watch it i love it even more. No body regrets watching it. Again, if it's Miyazaki TM, I'll buy it gladly! I gotta say, it's pretty hard to make a valuable adaptation from a book (tons of people have failed in that task), but this just feels right. The aesthetics, the ambience, the plot, the endearing characters... what's not to love? Every element works just fine. Maybe it's not as poetical as Spirited Away, but it's still an adorable love story. Out of all of Miyazaki's movies...I probably hate this one the most. It's not like it's bad, but you can just tell that Miyazaki didn't create the story, so I feel like it was lacking the charm of his previous titles. If you're a fan of Miyazaki and love his work then go get this movie, but if you've never heard of Miyazaki or any of his other films I probably wouldn't start with this one. Very Good: Warm story about wizards, magic, and goodness :) Studio Ghibli delivered yet another beautiful story that I was totally engrossed in. I always marvel at the animation and the attention to the finer details in their works and this didn't disappoint me at all. I'd love to watch this again and again. I'm speachless :) The movie was absolutely fantastic! The art was just excellent. Everything is so much detailed (from the sceneries, to the characters, the effects, the stuffs, down to the every atom of detail on Howl's clockwork castle). And I just love the soothing aura that every Studio Ghibli film has.